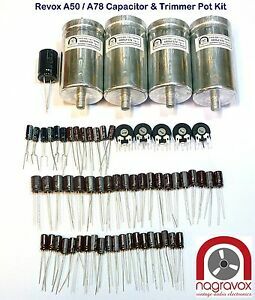 Details about Revox A50 Revox A78 amplifier capacitor & preset trimmer upgrade kit. See listing IMPORTANT STUFF. I only process orders once a week. Once you have received kit please email me directly (no Ebay mail please!!!) requesting service sheets for your full kit telling me WHAT kit you have ordered (this saves time as I then don't have to look it up which makes me cranky). My email help desk is available to anyone purchasing a full kit. Don't struggle if you are confused or have a problem, ask for help. Thank you for buying from us.